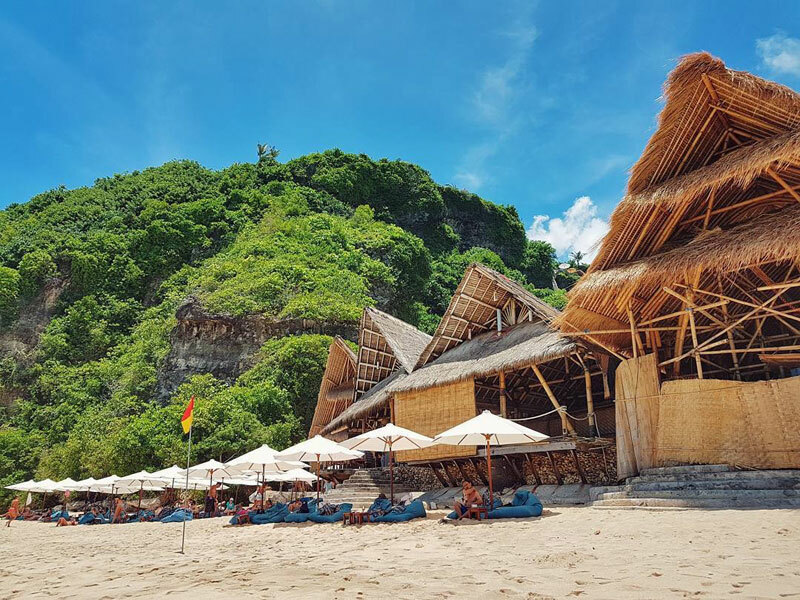 Bali is home to many beach clubs – where you can sip cocktails, swim and watch the breathtaking sunsets while you feel the warm sand beneath your feet. 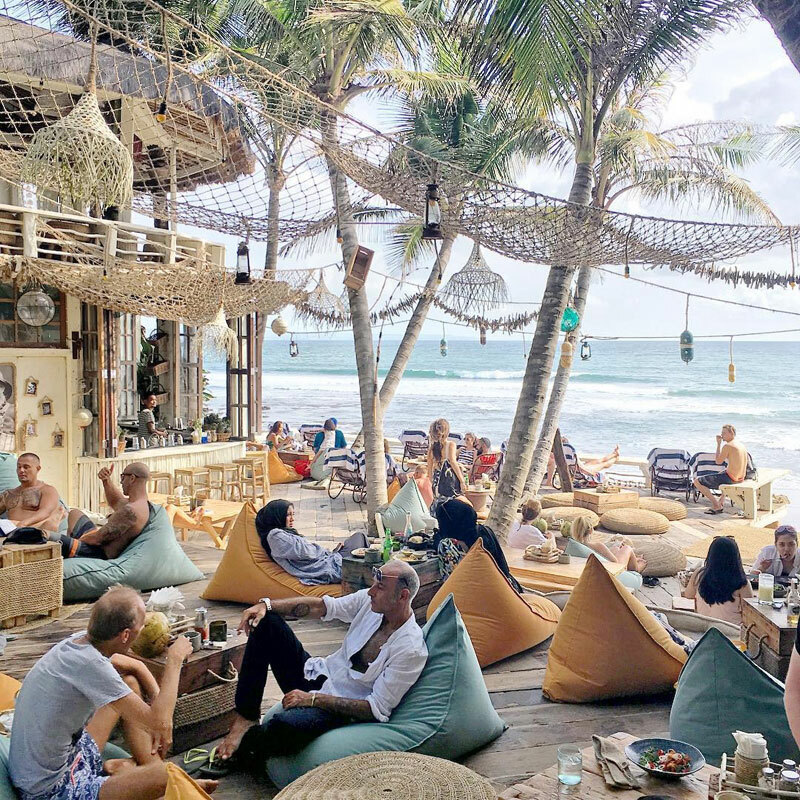 But how can you find those with reasonably-priced beers, free entrance, an all-round laid-back ambience, fewer crowds, great views and amazing beach front swimming pools? We’re not kidding. 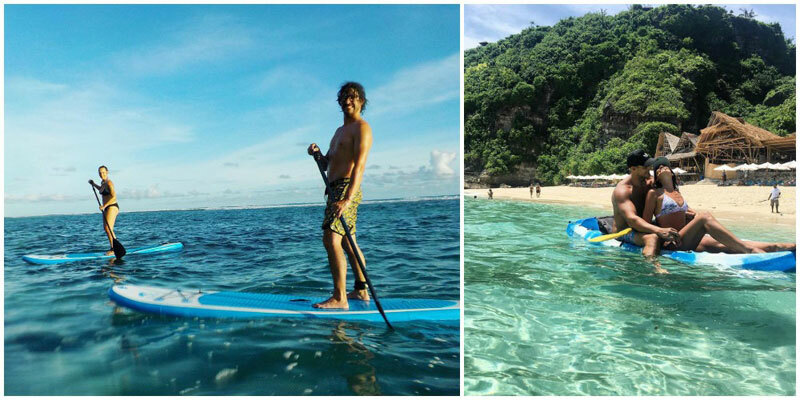 They actually exist, right here in Bali! 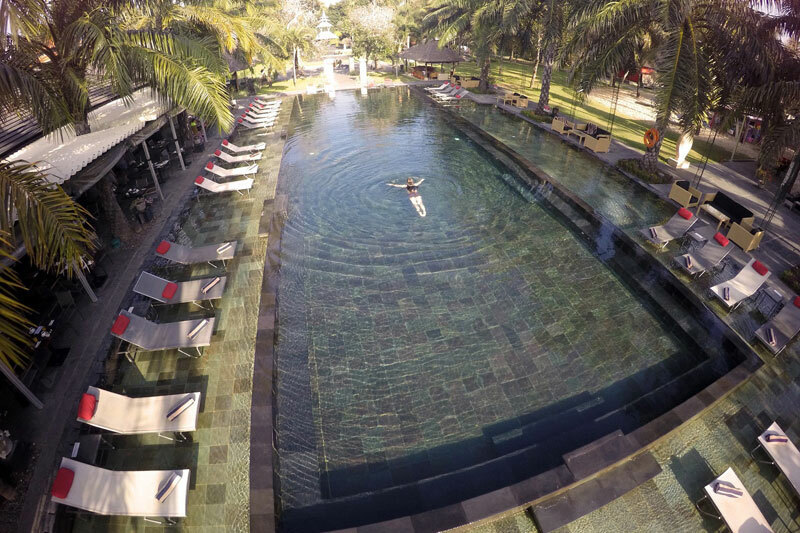 Komune’s Keramas Beach club Resort, located right on the black volcanic East coast of Bali, is a great place to spend the day, sipping cocktails, feasting on a delicious meal and swimming in the circular pool that looks out to the world-famous Keramas surf break. 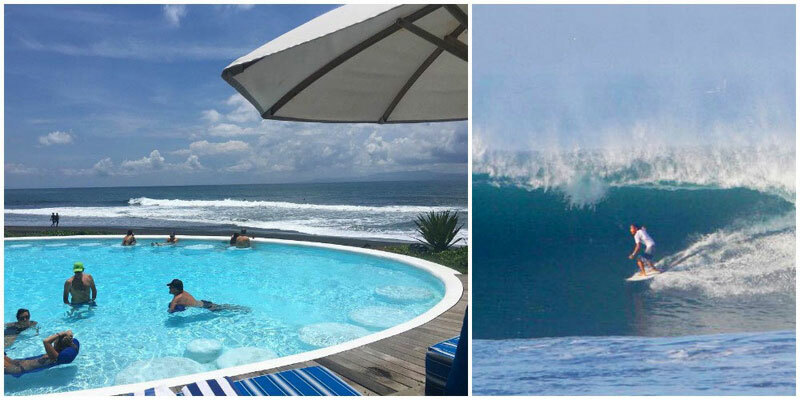 A great view for the holidayers, and for surfers, it is a true paradise! 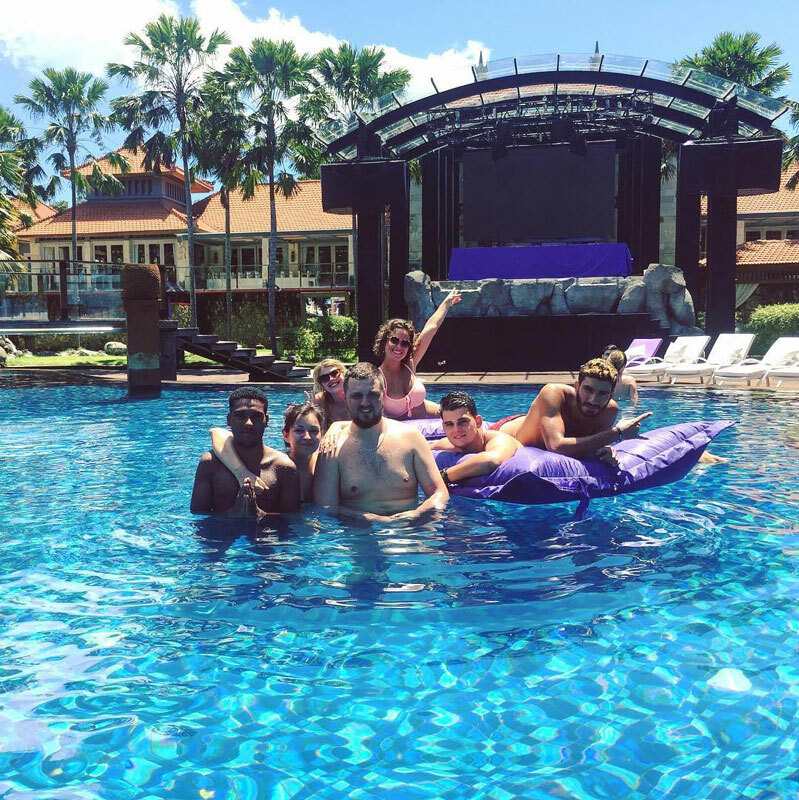 Imagine floating the day away, relaxing on one of the inflatable pool toys while gazing at the view and splashing your hands and feet in the water. 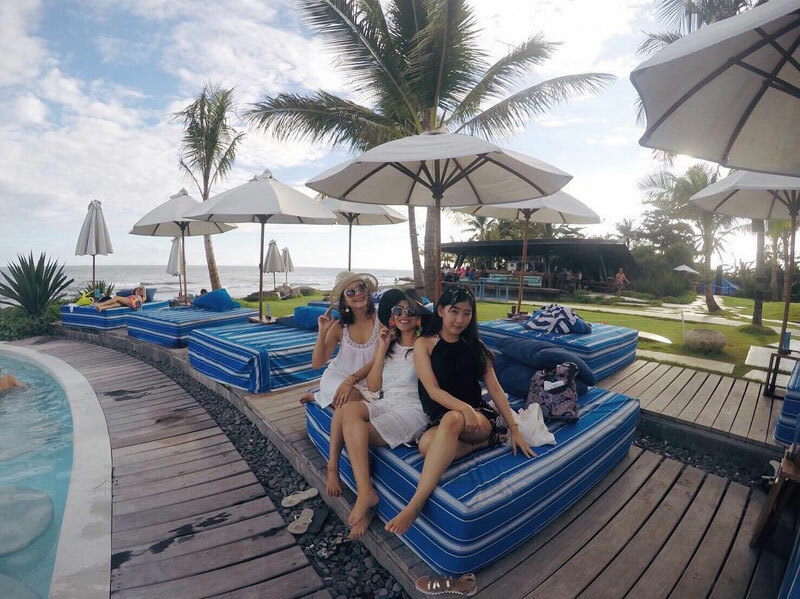 Don’t forget to wear sunblock as Bali’s tropical sun can be vicious! 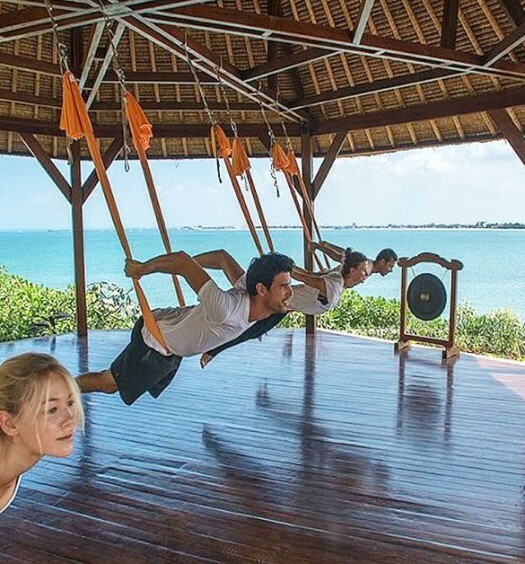 The resort also boasts of an on-site health hub to go for a pampering massage or a workout. 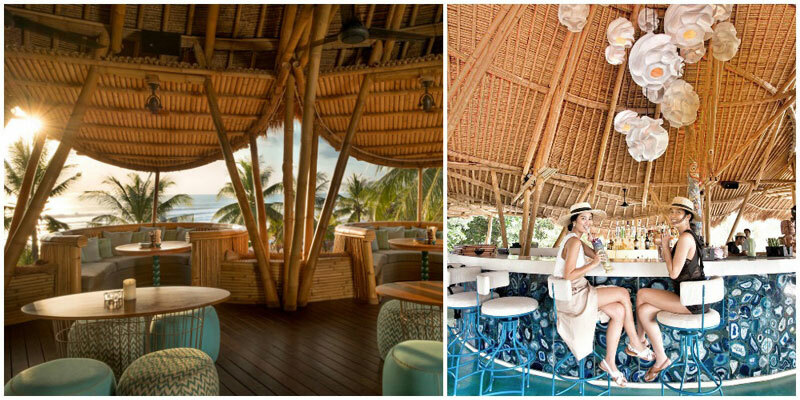 Komune’s Keramas Beach Club has got a fairly priced menu with healthy traditional Balinese and Western cuisine. Kids’ menu is also available. 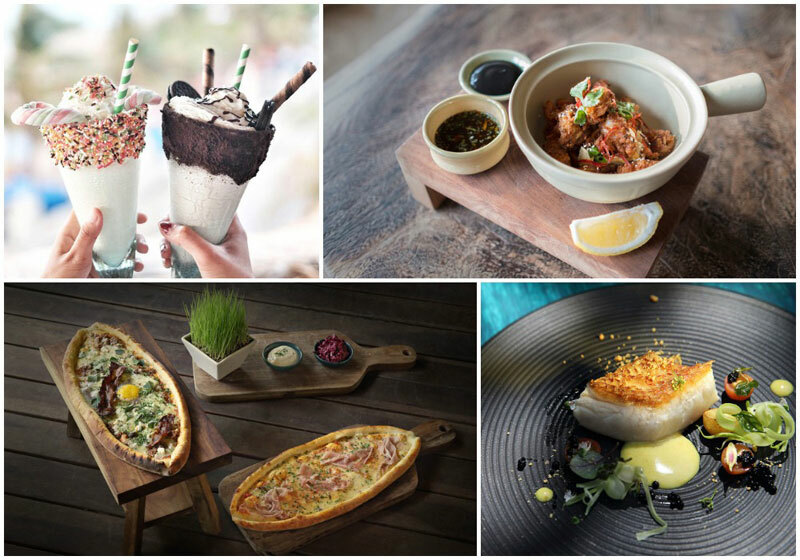 With fresh herbs and veggies from the on-site organic garden, complete with fresh produce brought in from the local morning markets, the food is outstanding! 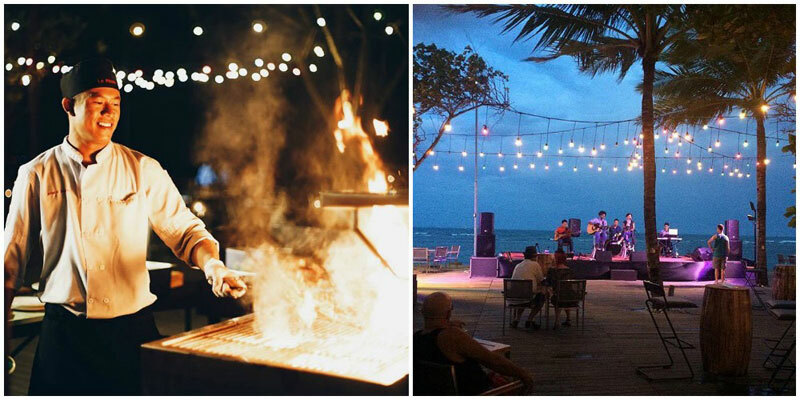 Enjoy home-baked bread, firewood pizza, tacos and mojitos and don’t miss out on the weekly seafood BBQ – truly a feast! 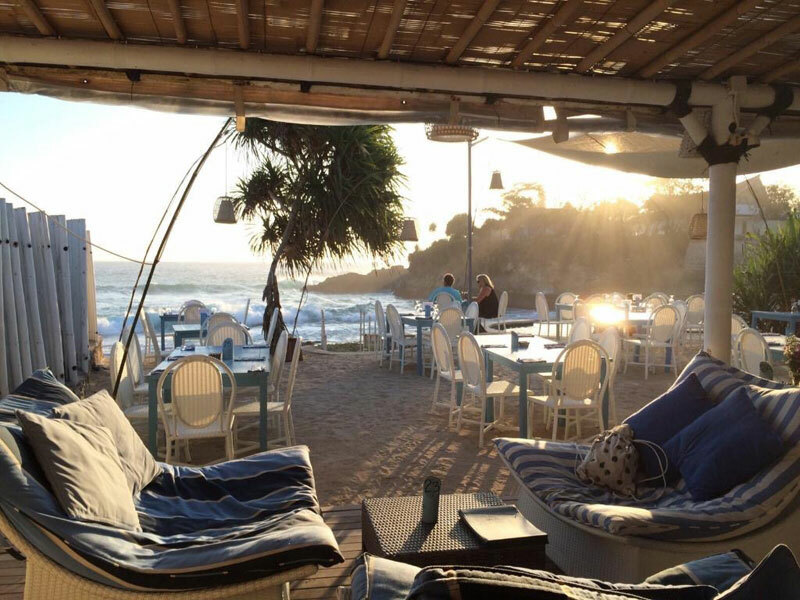 After the sun goes down, it’s time to snuggle up together to watch a movie under the stars at the beachfront outdoor cinema. 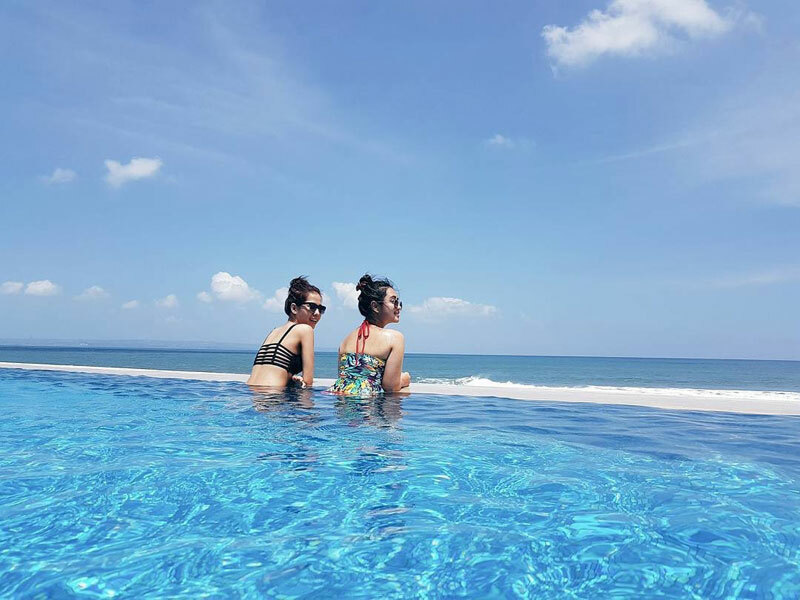 What a perfect day! 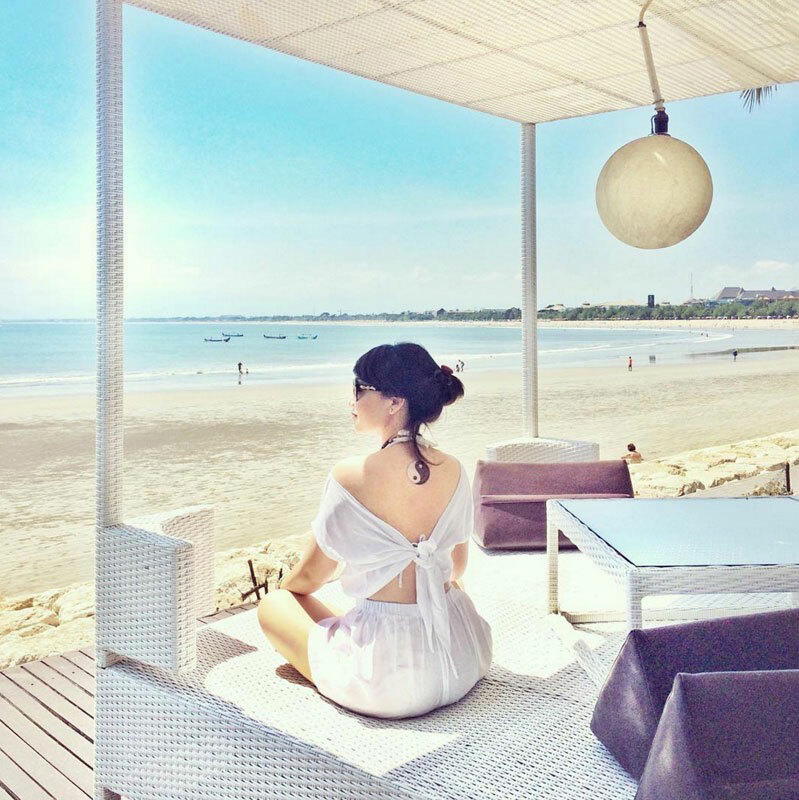 Located in The Bay Nusa Dua and ruled by shades of purple, Agendaz Beach Club is a stylish beachfront venue with great services, family-friendly facilities and reasonably priced food served in large portions. 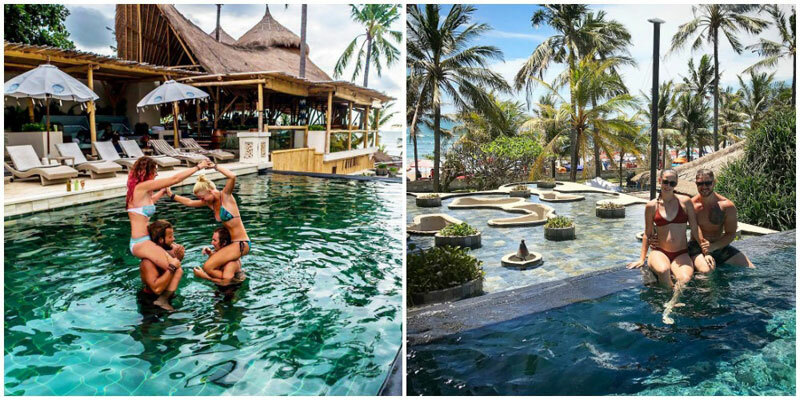 Agendaz Beach Club features a stunning double-tiered swimming pool with purple beanbags to lounge on and a shallow wading pool with inflatable ducks for the kids to play with. 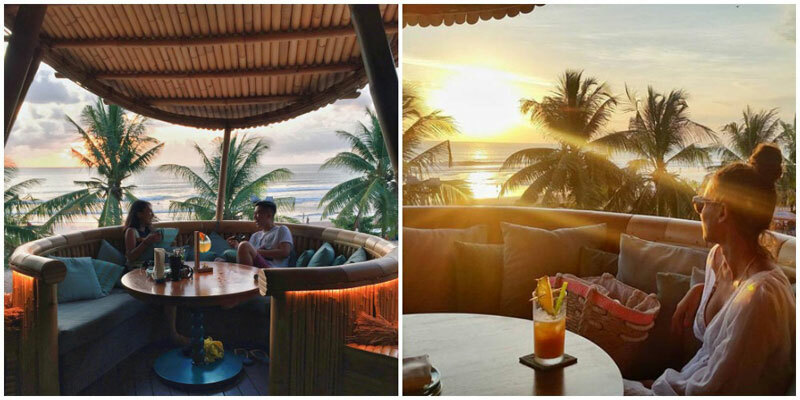 After a day of full relaxation and family fun, your heart will skip a beat when gazing at the magical sunset. 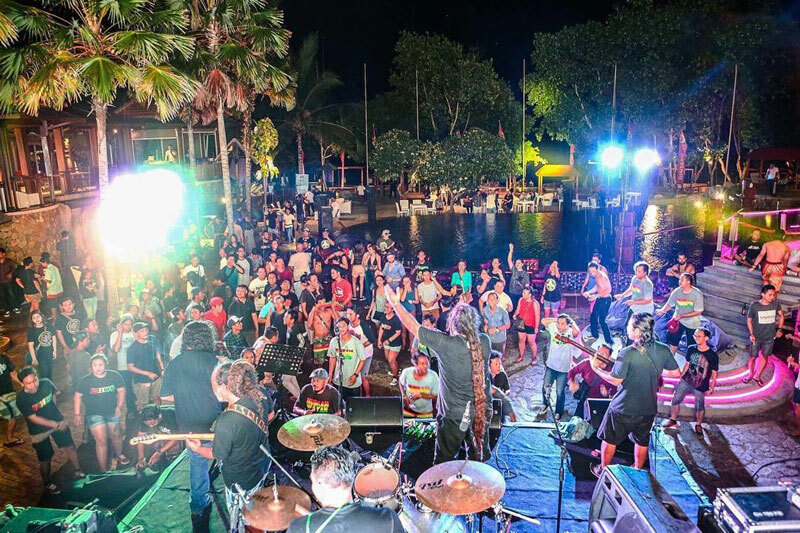 Indulge in the amazing Thai food at the on-site Siam Kitchen and wait for the DJ to take his place in the evening, as the party starts! 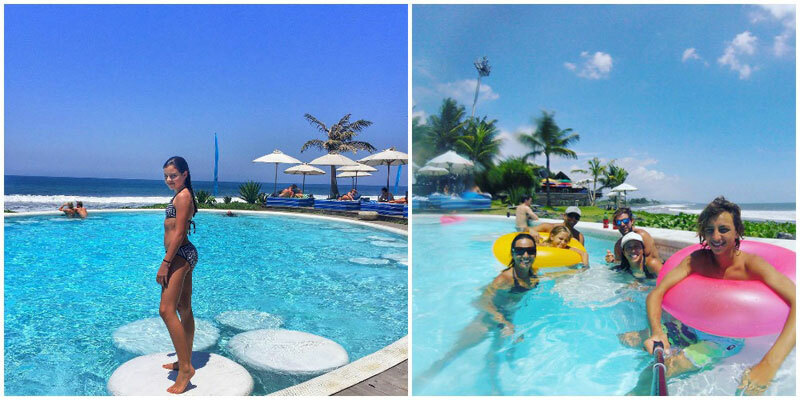 The Whacko Beach Club is a smaller-scale, family friendly beach club located in Tanjung Benoa, close to Sanur in south Bali. 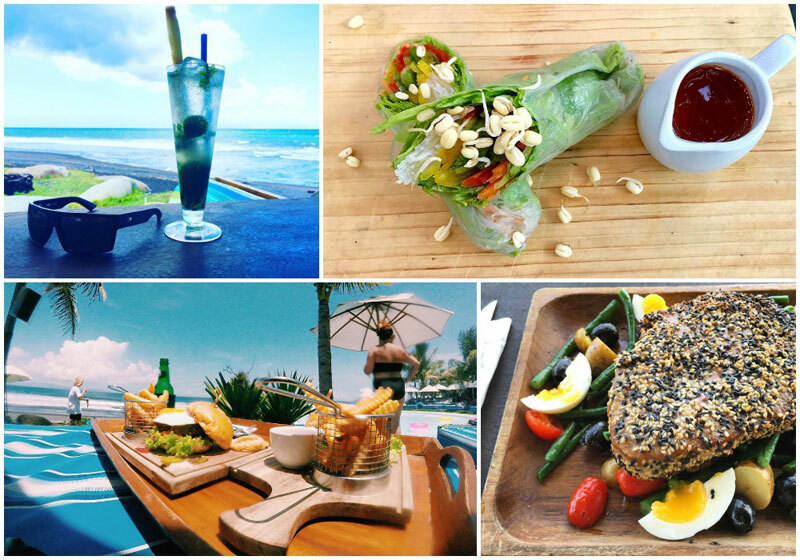 An amazing place to spend the day lounging, swimming and feasting on delicious drinks and food. 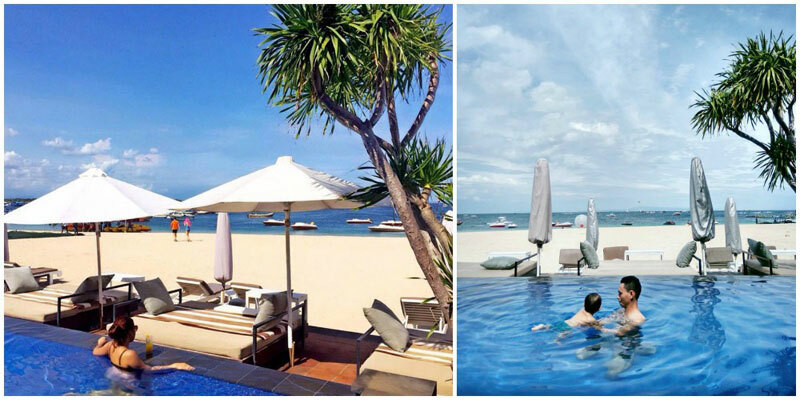 Here, you can suntan on the poolside daybeds with relaxing lounge music or go for a swim in the sea or the infinity pool. For adrenaline junkies, try out watersports such as flyboarding. Who says you need wings to fly? 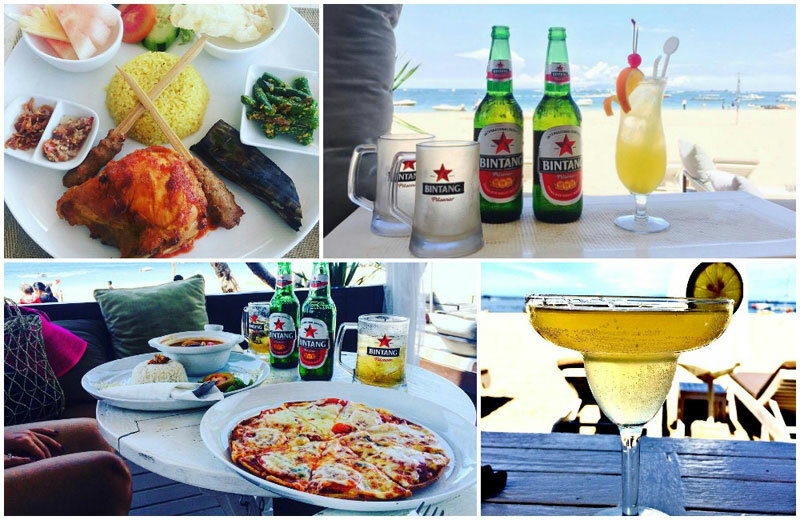 Whacko Beach Club serves huge portions of both Western and Indonesian food. Get some delicious nachos to go with your beer or try the calamari. 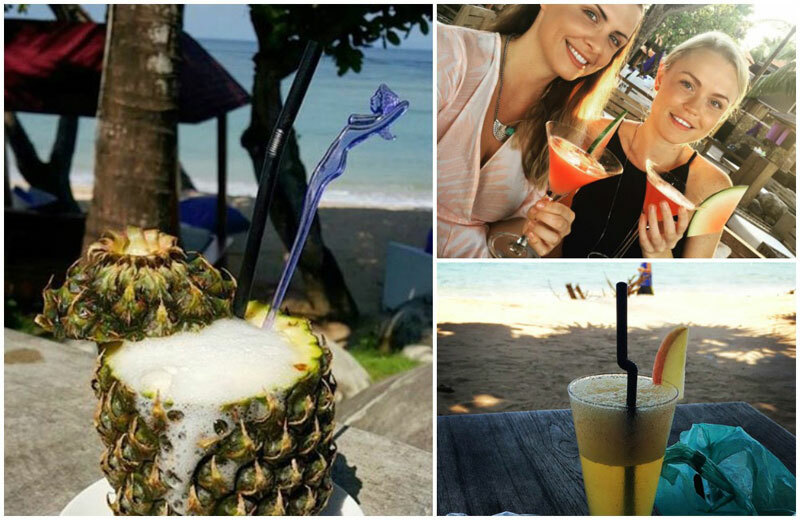 You can enjoy these delightful snacks tropical style in the gazebo, where you can enjoy the stunning ocean view. 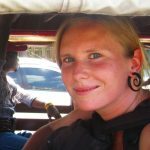 On clear days, you get to see the Lombok’s Mount Rinjani above the clouds – a view you don’t want to miss! 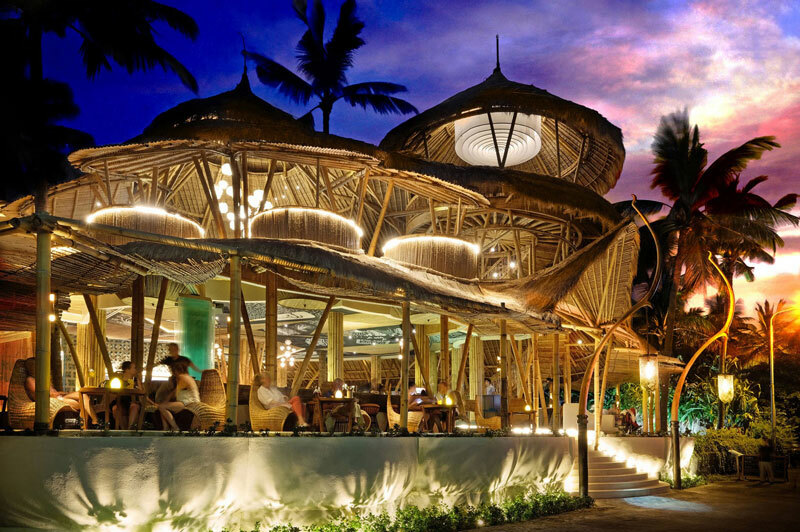 Located right on Kuta beach, in between the sandy shore and Discovery Shopping Mall, lies Oceans 27 Beach Club and Grill. 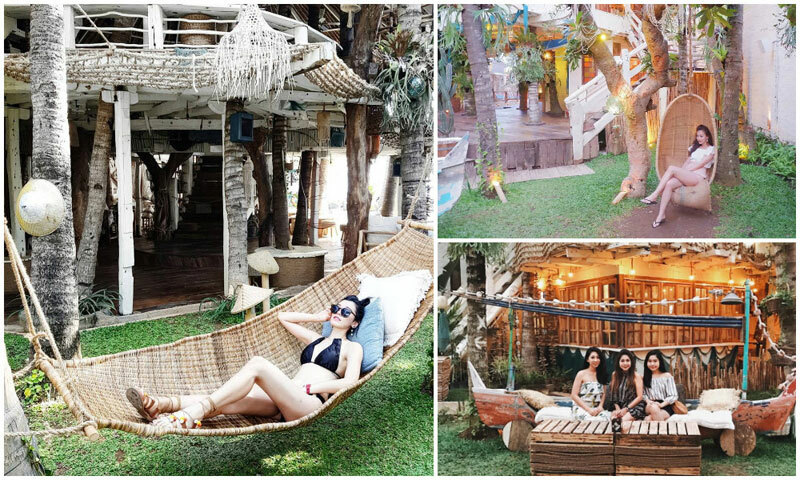 A true chill-out oasis right in the middle of Kuta’s hustle and bustle. 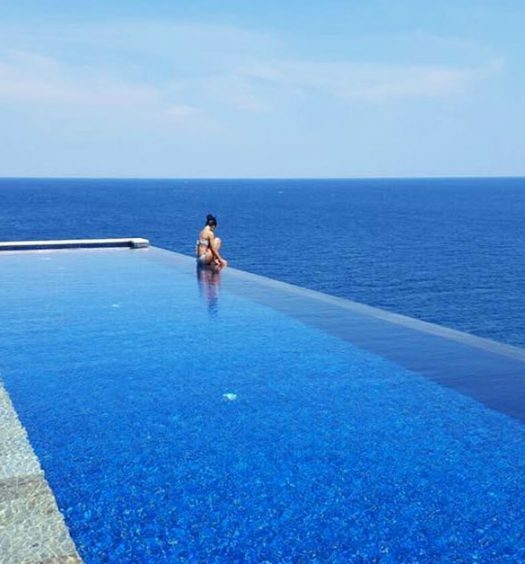 A glistening infinity pool sits at the front, allowing you to gaze at Bali’s magnificent sunset while leaning over the edge of the pool with a tropical cocktail in hand. 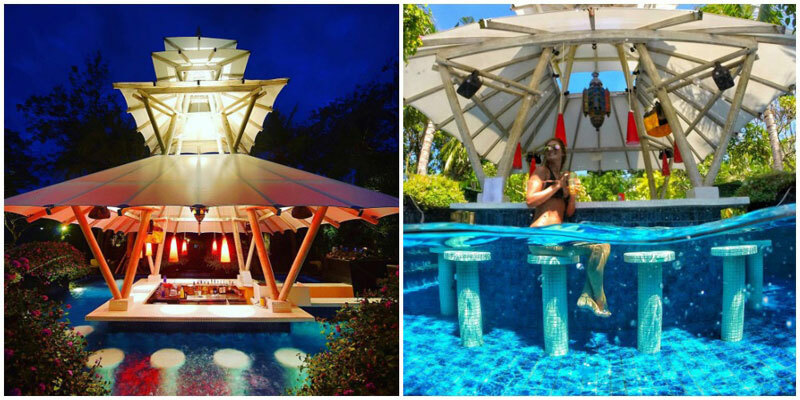 Around the pool, there are cabana lounge spots and comfy daybeds where you can read a book in the shade of a parasol or soak up the sun, catching that gorgeous tropical island tan. 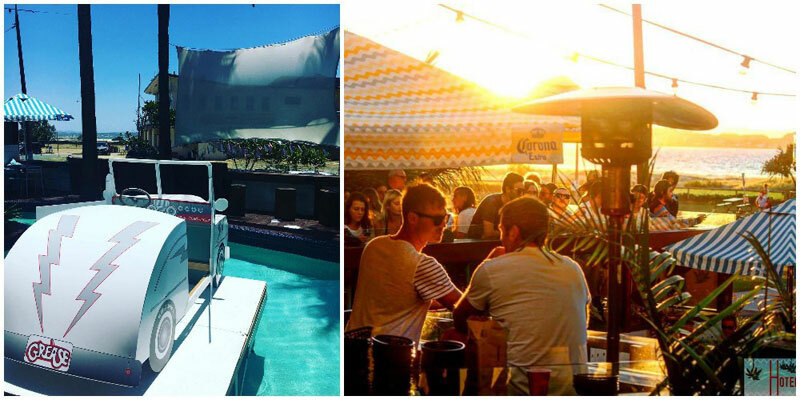 The ambience is super relaxed, with chill-out music played by internationally renowned DJs from 5pm onwards. Let the party begin! 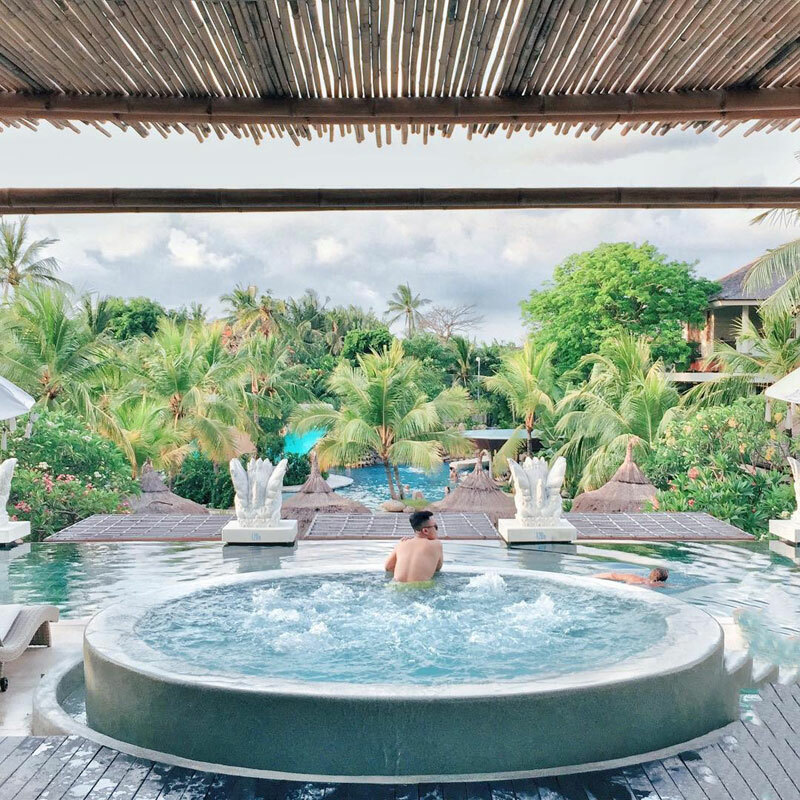 This elegant eco-friendly beach club in Nusa Lembongan, a short boat ride away from Bali’s main island, is the place to go for laid-back, beach-chic holiday vibes. 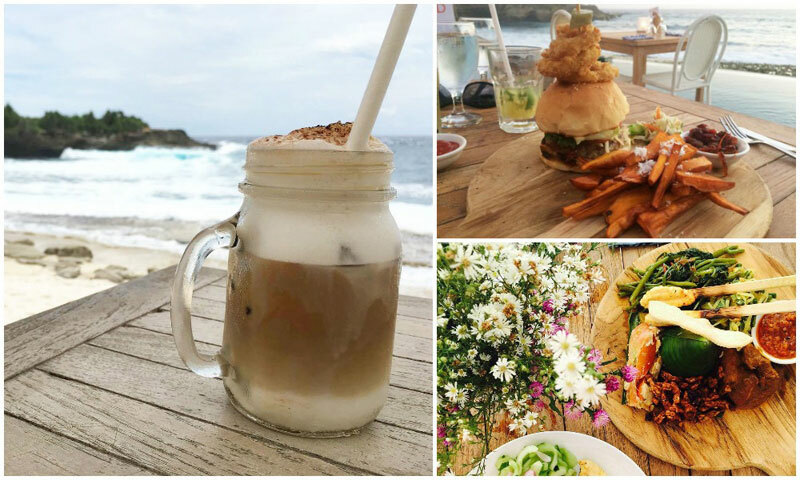 Here’s the perfect place to unwind completely, taking in the breathtaking raw nature around you as you listen to the waves crash gently on the shore and enjoy outstanding drinks and food. 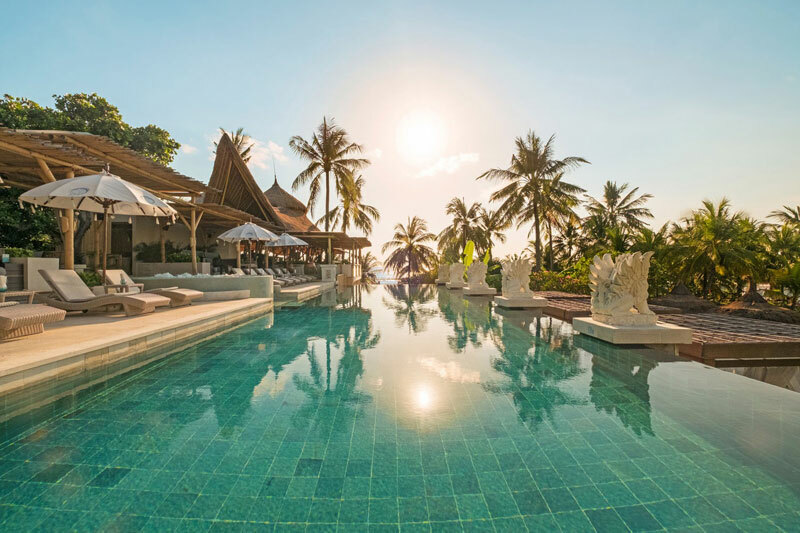 In the day, you can cool down in the crystal clear infinity pool, and after sunset, you can enjoy a wonderful family meal or romantic dinner under the beautiful lanterns. 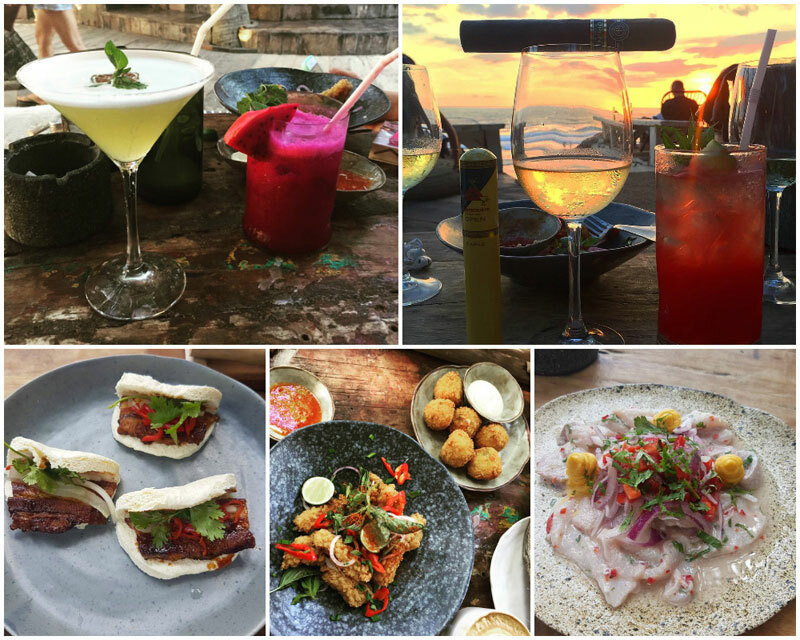 The prices are reasonable and the quality of food and cocktails are good! 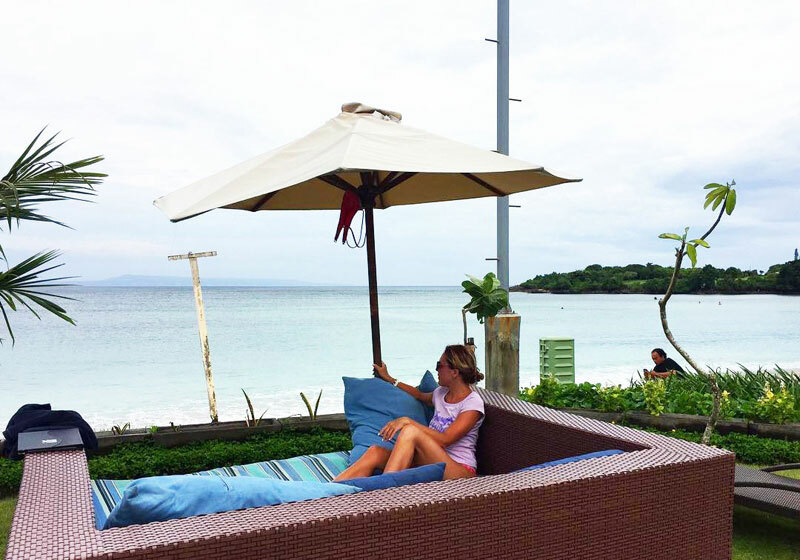 It has been said that The Sandy Bay serves one of the best seafood on Lembongan island. 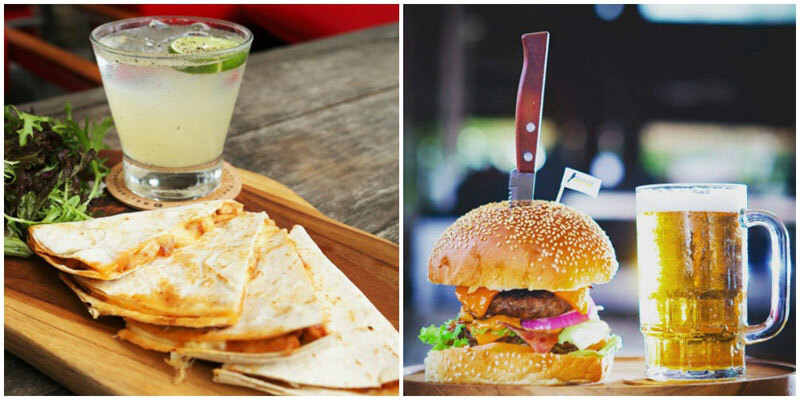 Don’t miss their great Indonesian food and Mexican fajitas too. 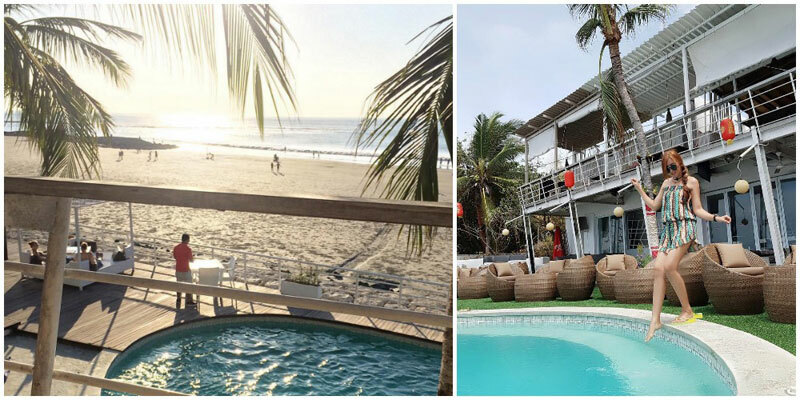 The following beach clubs require entrance fees, but they have some amazing features that we simply have to include them. Read on below! 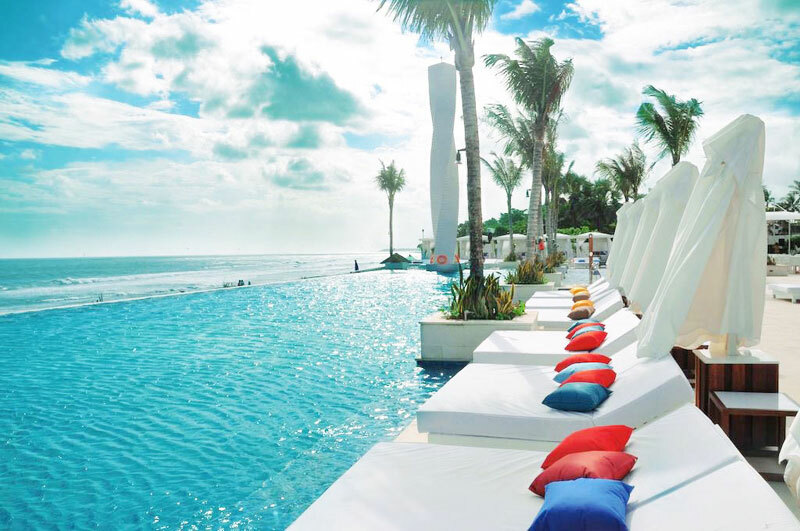 Enjoy the peace and quiet ambience at Vue Beach Club, located in the LV8 Resort and Hotel in Canggu. 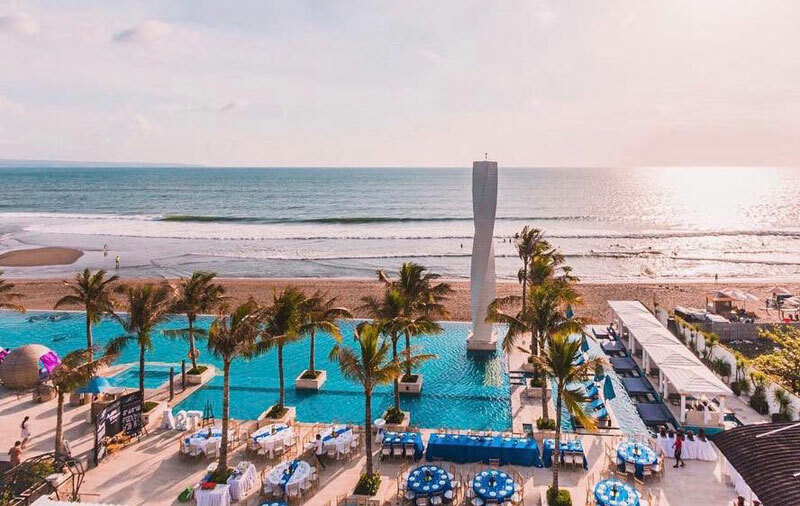 It boasts of a stylish décor, wonderful laid-back beach vibes, breathtaking sunset views in the evenings and a glorious and gigantic oceanfront infinity pool that appears to merge with the ocean. 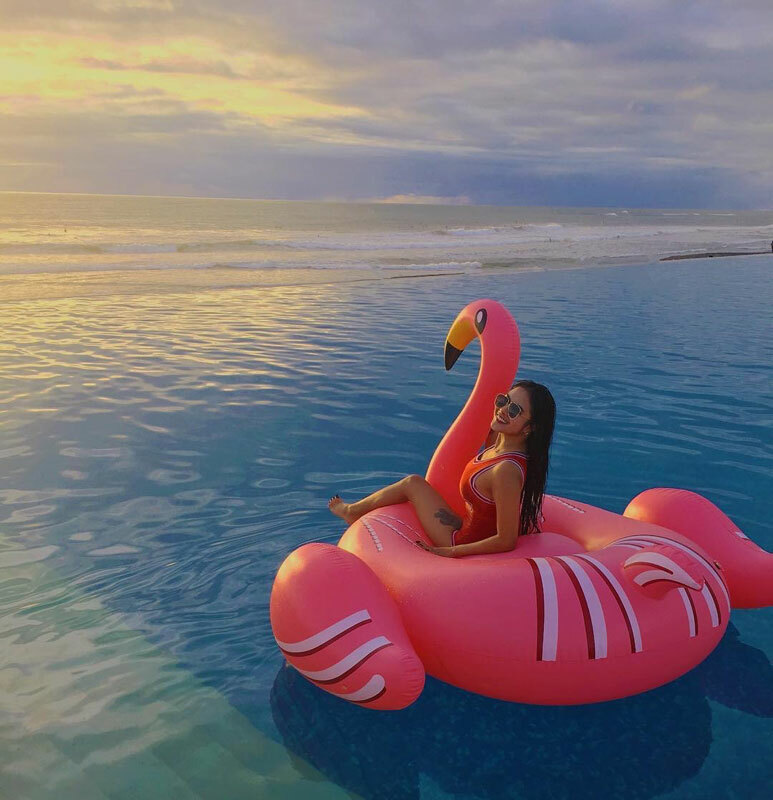 For some whimsical moments, you can float away on a giant inflatable flamingo! 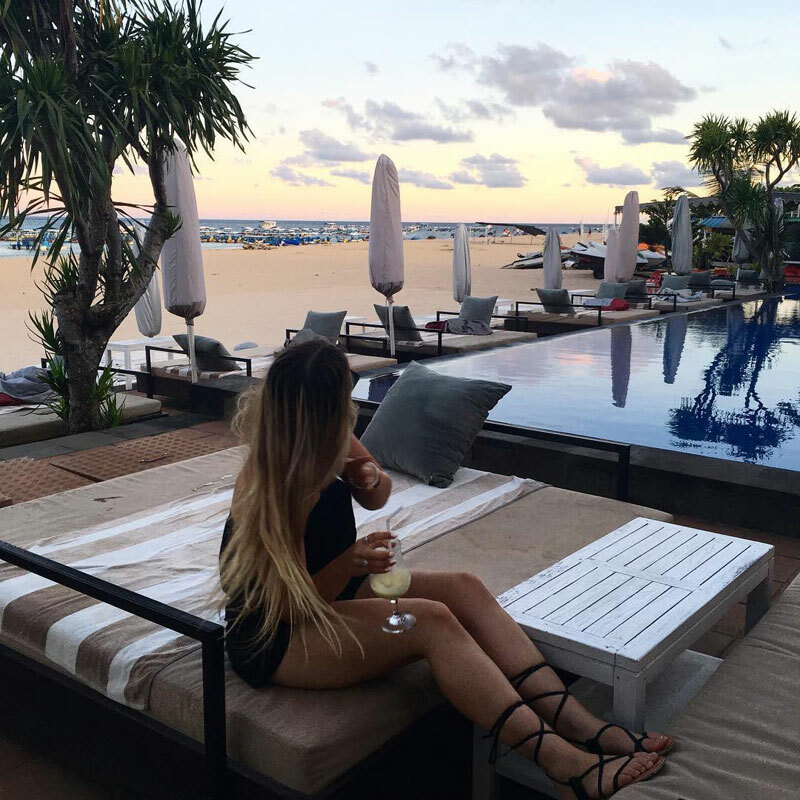 You will find deluxe sunbeds by the poolside, and the classy daybeds are great shady spots where you can spend quality time with loved ones. 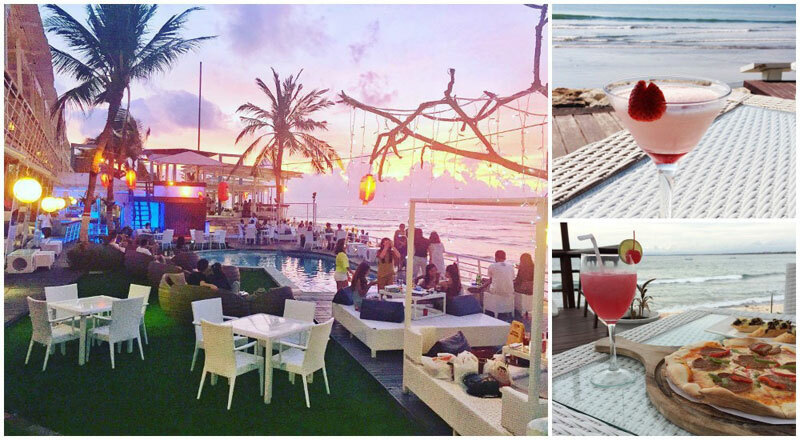 Vue Beach Club also features internationally renowned DJs for amazing beach parties you will remember forever! 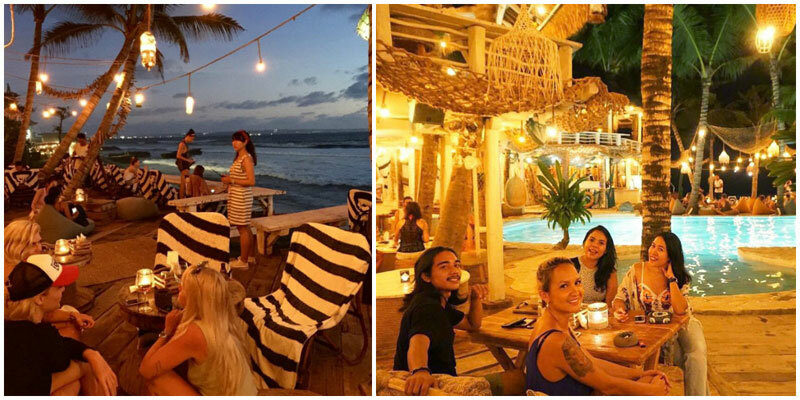 Part of the Ungasan Clifftop Resort, the exclusive Sundays Beach Club is located at the foot of the cliff, right by the ocean. 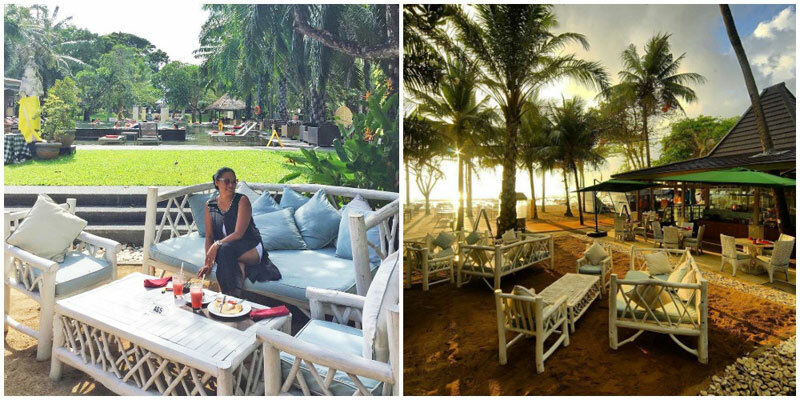 This little paradise boasts of amazing views, relaxing lounge spots and lots of free watersport equipment for guests to use, such as kayaks, snorkeling equipment and stand-up paddle boards, subjected to availability. 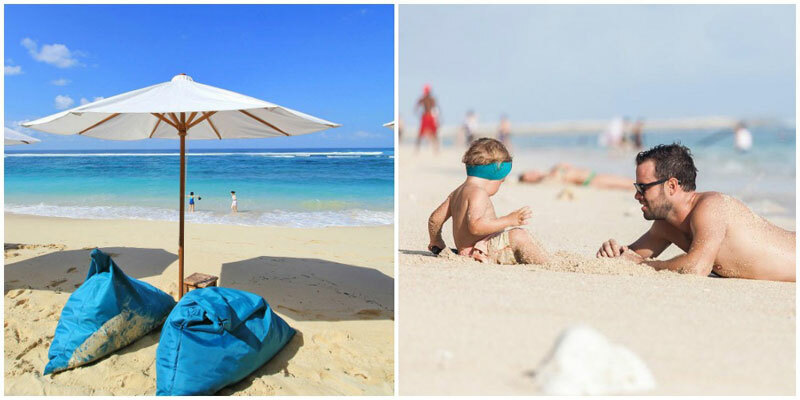 Comfy beanbags shaded by sun-umbrellas are great places where you can watch the kids play in the water while you enjoy some sunset cocktails. 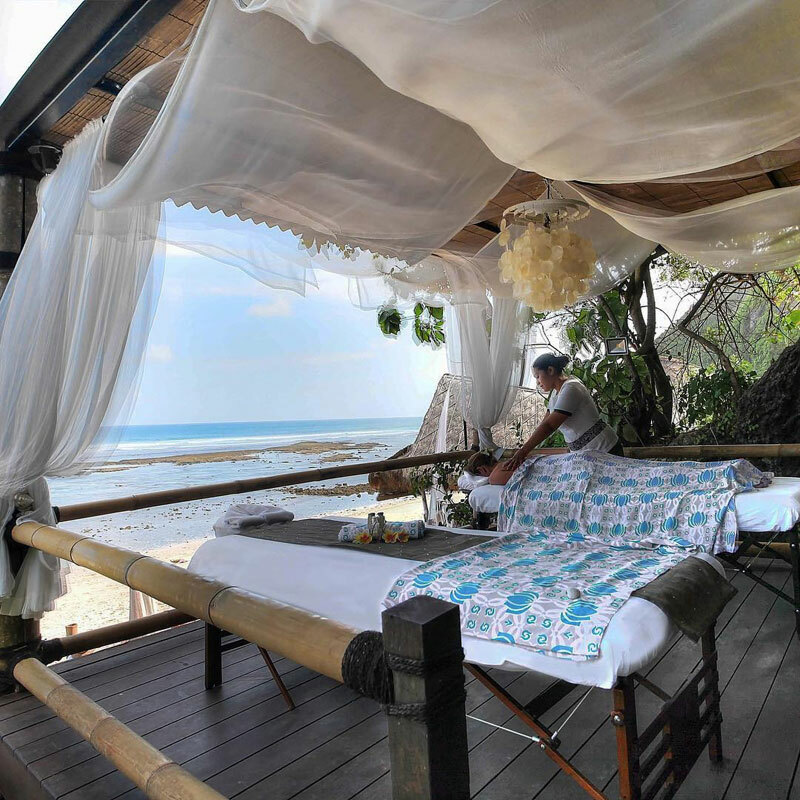 How about a beachfront massage in the fresh ocean air while you listen to the waves? 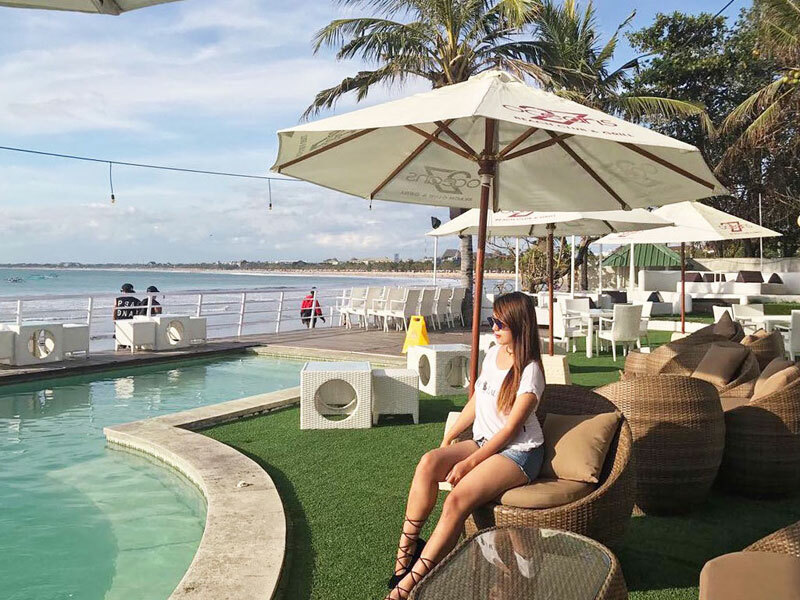 Surf and Turf Beach Club has got it all – slides, thrilling activities, amazing swimming pools, and delicious yet reasonably-priced food. 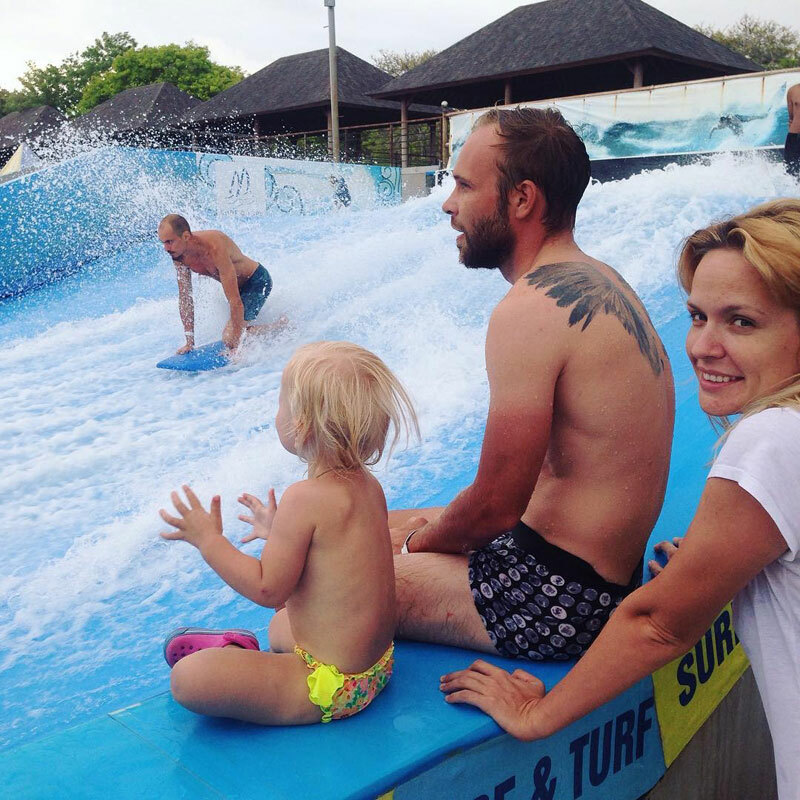 Everything for a great day of family fun! 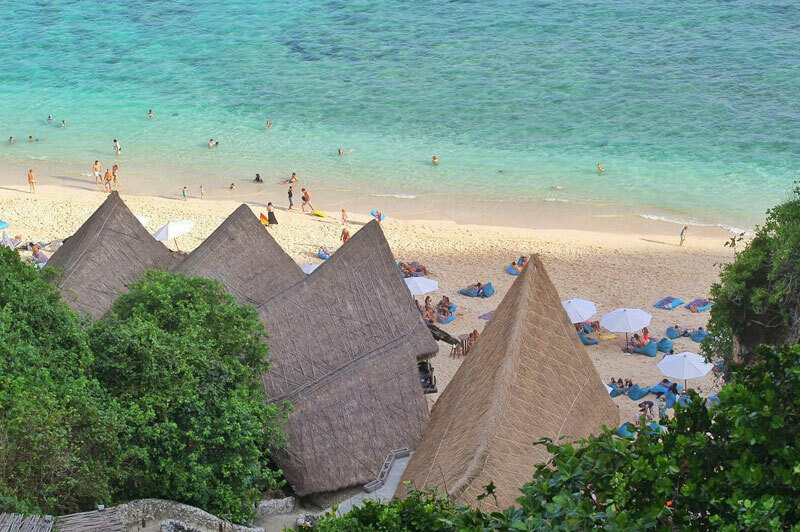 This beach club, located in Nusa Dua, is the first in Bali to present ‘Surf Rider’. 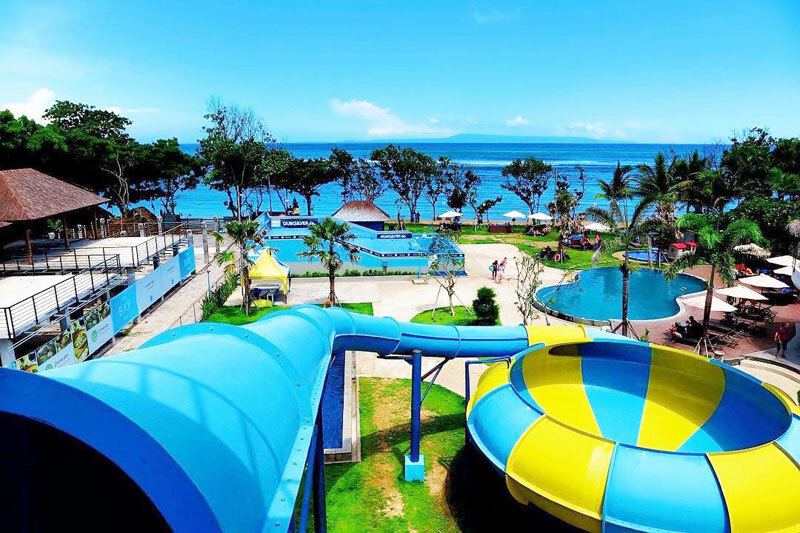 Both you and the kids will love the two colorful slides and ‘space bowl’! You can canoe and cycle here too. 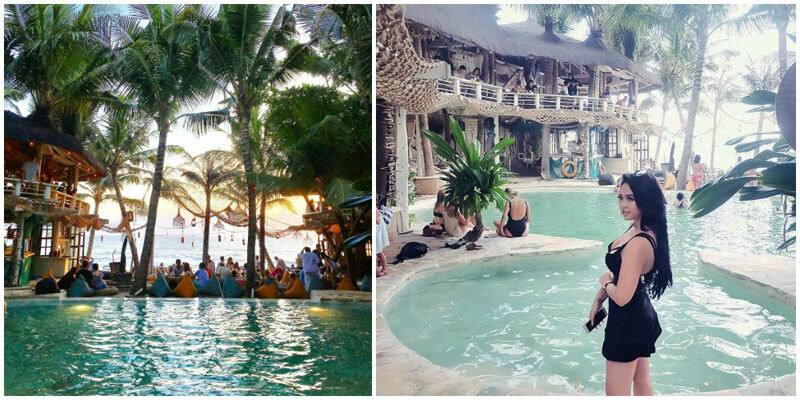 Are there any other interesting beach clubs with swimming pool and free entrance we missed? Do share with us!